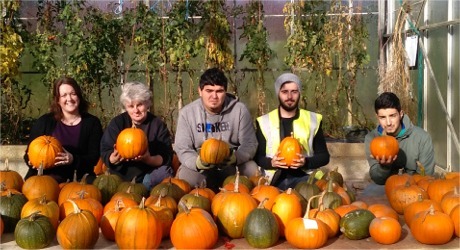 AN Inishowen organic farm is delighted after selling out its bumper crop of pumpkins ahead of Hallowe'en. White Oaks Acorn Project has been supplying the general public, local restaurants and shops with fresh, chemical-free vegetables and herbs and its pumpkins have proved a big seasonal hit this year. The project operates on the same complex as the IOSAS Centre and White Oaks Rehabilitation Centre at Lenamore Road, Muff, facilitating therapeutic work for residents. Programme co-ordinator Maire Gormley said the organic farm is now supplying up to 100 vegetable boxes a week to customers in the Derry and Inishowen. White Oaks’ home delivery scheme keeps the project’s ten full-time and part-time staff busy making sure there is enough seasonal produce available to dispatch each week. White Oaks community farm with some of its bumper crop of pumpkins. Customers can avail of a large box of vegetables or a juice box for healthy and nutritious drinks packed with essential vitamins. “We send out around 100 vegetable boxes three times a week to the Derry, Muff and Buncrana areas. People like to know that it is grown just up the road and they are getting it really fresh," said Maire. The project, which recently celebrated its 10th anniversary, was inundated with demand for pumpkins after harvesting its best crop this year. Hundreds of Whiteoaks' pumpkins will now be carved into Jack O’Lanterns or cooked in pies, stews and soups as Hallowe'en approaches.